It is November. November of NaNoWriMo fame. November of Adoption Awareness fame. Over the past few years, I have stood on the sidelines watching Adoption agencies turn it into an advertising blitz. I have seen tearful paeans being sung to the institution of adoption by parents like me. I have seen angst filled posts by first mothers. The adoptee voice has largely been suppressed under the din unless you choose to go digging around, which I did. #FlipTheScript trends among the circles I follow on Twitter. I read, absorb and try to make sense of a viewpoint that largely paints people like me as monsters. But I am not, I want to say. Yet, I demur, let the feeling pass and inspect my own thoughts. It took me back to 2010 when adoption came into my radar following a burning need to parent. As I sifted through the various means to adopting a child, I circled back and fixated on private domestic adoption. I argued with myself that foster adoptions are hard. I dig down deeper and find that the reasons are selfish. I had missed out on carrying a child to term. I had missed out on giving birth. If I were to adopt, I wanted to start at the very beginning. I wanted in on all those things new mothers do with their children. I wanted the exhausted nights, the sleep deprivation, the drool and spit fueled days. Most importantly, I wanted what I could not have. Yeah. I read what I just wrote and despise myself. Eventually when we did adopt, our children came to us as toddlers. I have since learned that adoption is not a one time event. Done, dusted and put away never to be visited again. I have learned that it is something you live. Day in. Day out. You deal with your children’s’ loss and you hurt when they hurt. You realize that they have two families and always will. You try to bridge the gap. You do the best you can knowing their lives will always be fragmented. So, year after year when I look at the way media scripts adoption I find it harder to stay silent. I want to raise my voice and say stop. I know there are people doing fabulous work out there. I want to piggy back and say s/he said it better. Then, I look at my children. I look at them years from now wresting with a decision they had no say in making and realize I need to exercise that voice and speak for them till they can do it themselves. I want to #flipthescript so to speak. I want my children to know that I acknowledge their loss. I want my children to know that I respect their mother. Most of all I want my children to know they have two families and that it is their normal and it is OK. They should never have to choose. Most of all, there is nothing lucky about being adopted. This month, I will be talking about adoption more than I normally do. If there is something you would like for me to talk about or if you have questions you would like to ask, please do. If I cannot answer anything, I will let you know. I understand many things about adoption from various aspects. I adopted my own son with 2nd husband, my child was 16. I have a birth sib that was placed into adoption because that was the ONLY option available, contrary to what she believes. When reunited she violated the sacred bonds between child and parent…because she believed adopting was WRONG for my son! I hear and feel the pain, suffering and the injustices that many adoptees have. no one gets to pick the perfect family/situation to be born and raised in. My philosophy has always been…we make decisions and life choices with the information we have at any given time! To second guess our decisions, particularly with our children, is useless. There are perhaps many a thing each of us would do differently if we COULD redo it…but…life doesn’t work that way. All adoptions are NOT BAD. There are real reasons for adoption in the world of ALL HUMANS. There was one statement that you said…. Do you really despise yourself for adopting your children? I’m sadden by that statement and sentiment! Particularly for your children! Hope they don’t learn that you despise yourself for adopting THEM and being their parent. GertMcQueen, I want to take the time to respond to your comment. I agree with you that there are real reasons for adoption. Primarily for children left in institutionalized care whether here in the US or Internationally. When I mention the word despise I specifically am referring to my desperation to be a mother to a newborn. I remember how much I wanted to be part of the baby’s life from the minute he or she was born. As a PAP I had then maintained a blog where I vicariously lived the life of the expectant parent with whom I was matched with then. Looking back, I feel a little sad for the person that was me and also a little pity for how much I thought I was entitled to. I do not regret adopting my children. They are the light of my life. I only wish I had explored toddler adoption and adopting from foster care before looking at private adoption. The agency I worked with is not someone I will work with if I could go back and do it over again. Adoption for our family was the right decision and I am fairly certain that my daughters’ other mother feels similarly. Yet, it does not erase the sadness that this had to happen. Laksh, thank you for the explanation. While I can NOT know what it must have felt like for you and others in similar circumstances, but I just can NOT accept putting one self down for decisions made in one’s life. I can and DO fully recall what was TOLD to me just before I first MARRIED. In those dark days when the all powerful Church CONTROLLED it’s members, and I was a pious believer…I was told that because I was pregnant, outside of marriage and the father of OUR child refused to be converted, I STILL COULD GIVE MY CHILD UP TO ADOPTION. At that time, the ONLY thought I had was how dare they THINK I didn’t WANT MY CHILD! So we were young that didn’t mean we didn’t WANT our child! It was years later, when other life circumstances happened, divorce $$ problems, other women/children, did the FATHER of my children WANT me to get those kids adopted. I was about to marry again, but gosh darn…the poor guy got cancer and DIED on me and two young children who loved him! 8 years later when I married again, that husband WANTED MY CHILDREN…but by that time the reunited sib GOT IN THE WAY OF MY FAMILY with her self-righteous nonsense that ALL ADOPTIONS ARE BAD AND EVIL. So please forgive me, if I come across angry, for I am, because NO ONE should come BETWEEN parent and child…even in an adoption! You wanted an infant, I understand that, you got toddler, I understand that…where’s the shame? There isn’t ANY. There are people that would rather see every child STAY in those foster homes and institutions NEVER having anyone, because THOSE people believe adoption is wrong. I don’t feel any sadness for ADOPTING. EACH and EVERY situation is so different there can NOT be a one-solution. Again, thank you for allowing me to speak so frankly. I hear you and I am glad you are able to speak your mind. I never say that I am ashamed of adopting. 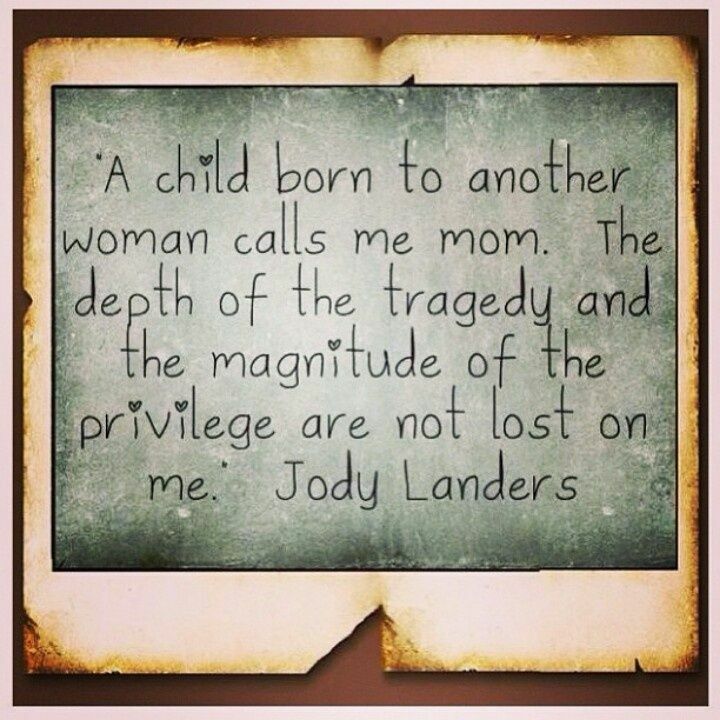 Just that I am ashamed of the entitlement I felt as an adoptive parent. I feel you are applying the word despise to my entire post. I only mean it in relation to my yearning for an experience I was denied and one that I felt I could get vicariously. At that point in my life, I was viewing adoption from only my POV. After the kids came, I realized the event that brought me so much joy also meant sadness for them and their mother. I celebrate being their mother but remember to steer clear of celebrating the day they came to us. I understand there is no right/wrong. Each situation is different and each story is unique. Perhaps we could take this offline for I think this discussion is worth having. thank you Laksh for allowing me to speak. In today’s world…words are throw around and we all get caught up in misunderstandings. Entitlement is another! that’s just another political buzz word that means nothing. I am content with my life decisions, I have two wonderful children, 7 grand children and 3 great grandchildren. Do I know each of them? No, But I am their ANCESTOR, via birth and adoption. I fully appreciate and understand your connection to how you have your children, bless you and them. Thank you for sharing. Your comments have given me much food for thought. What you write about adoption takes me to a world I have never been in. It is a scary place for me and I might have been there but for chance. I think it is a HUGE thing to be able to accept that your children have “another” family. Ever since I read this post, I have been asking myself what it would be like if my daughter had another person she called ‘amma’ and, I am such a shallow person, I hate the idea. God, how much generosity you have…. LG, that is the problem with hypothetical situations na? We cannot possibly know how we will act when circumstances are different. I could not have fathomed having issues with fertility or pursuing adoption at 27. Having walked the path, I have found it is a series of steps really. One decision leading to another and listening to the voices of those who have walked the path. It does not make you shallow. Just someone who have not been down the path.